Topics: Document Finder, and Credit Card Payments. Age: It went live on September 19th 1996, making it over 21 years, 6 months old. 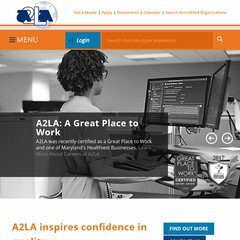 a2la.org R103 - GENERAL REQUIREMENTS: PROFICIENCY TESTING FOR ISO/IEC 17025 ..
a2la.org Document Finder - A2LA - The American Association for Laboratory .. The estimated 234 daily visitors, each view 2.20 pages on average. grsusa.com Gauge Repair Service ~ Welcome! dnanme.com Home DNA & Paternity Tests: Legal Test Kits & Testing .. The programming language environment is ASP.NET. There are 2 Nameservers, dns1.swiftsystems.com, and dns2.swiftsystems.com. It is hosted by Swift Systems Inc (Maryland, Frederick,) using Microsoft-IIS/6 web server. PING www. (72.13.99.31) 56(84) bytes of data. Website load time is 1172 milliseconds, slower than 68% of other measured websites. As well, a ping to the server is timed at 45.5 ms.